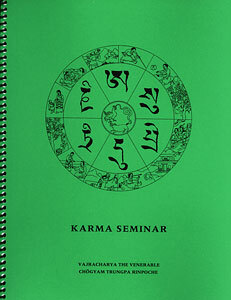 This collection presents teachings on karma given by Vidyadhara Chögyam Trungpa Rinpoche. 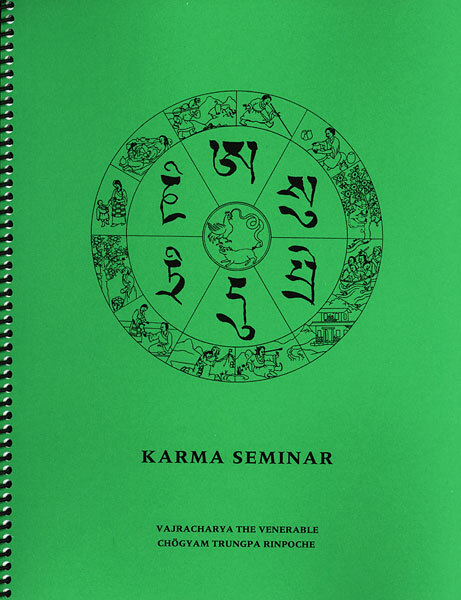 In Part One, a 1972 seminar at Karme Chöling, Rinpoche explores the mechanism of karma and its functions. He shows how our karmic situation develops and is born from ignorance, and explores how we solidify our experience through the concept of past, present, and future. He presents karma not as predestination, but the freedom of a choiceless choice. He teaches how to use karma as a path, tracing the development of meditation from spiritual materialism to the discovery of nowness. Part Two of the collection includes two articles on the twelve nidanas, "The Wheel of Life," from Garuda II, and "Karma & Rebirth," from a course taught at Colorado University in 1973.